A quality start system is essential to your swim team’s success. One of the most important components of any swim meet is the start system. The start system is what alerts the swimmers to when it is time to begin the race, giving everyone an equal opportunity at winning the race. When your pool becomes the home to races of any kind, including practice races that get your swimmers used to the methods of a real race, it is important to have the right swim meet start systems to best fit your needs and help your swimmers identify when the race begins. The state-of-the-art Colorado Timing Infinity Start System is a great option for pools that cater to swimmers of all skill levels and abilities. The small case makes it a portable option you can take from pool to pool if you will be heading to a pool that isn’t your home pool and they do not have a start system of their own. This system features both an audible sound and a corresponding strobe light that flashes at the exact same time, allowing both hearing and hearing-impaired individuals to clearly identify the start of the race. You will also enjoy the false start feature that immediately alerts all swimmers when a false start occurred, bringing them back to restart the race. The unit features 40-watt corosion resistant speakers, a gel-cell battery, wired microphone, start button and 115V charging capabilities. A tripod is available. 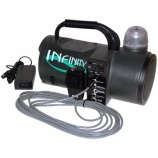 The IST Swimstart Electric Start System is another great portable option for your pool. This start system features a PA system for announcements, a tone and strobe light alert to indicate starts and a recall tone to bring swimmers back after a false start. The small circuits used in this system allow it to be housed in a small box for greater portability. External connections allow you to connect and disconnect each of the components without exposing them to the water, increasing the risk of electrocution. The start system is an important component to all your summer swim team races. If you need one for your pool, these two great options will provide you with the exact features you need to cater to all your swimmers without spending a lot of money on an installed system. Both systems are small and easy to transport, giving you greater flexibility in your start system.